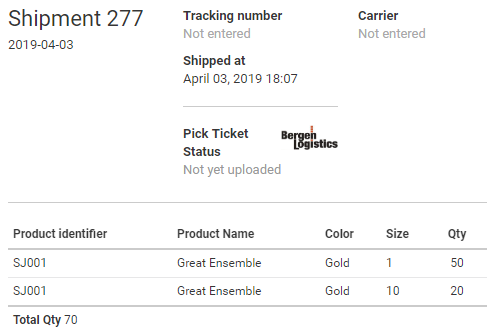 For Consignment Orders, once you create your Pick Ticket & Ship your products, your Source Warehouse inventories will decrease and your Destination Warehouse (Customer's Consignment Warehouse) inventories will increase. As shown in Figure 1, before my shipping to my customer's consignment inventory, the "In Stock" inventory amount for the SJ001 product sizes 1 and 10 is 200 for each. In Figure 2, we are planning to ship 50 each of Size 1 and 20 each of Size 10 of the SJ001. In Figure 6, you can see the Customer's Consignment Warehouse with 50 of Size 1 and 20 of Size 20. 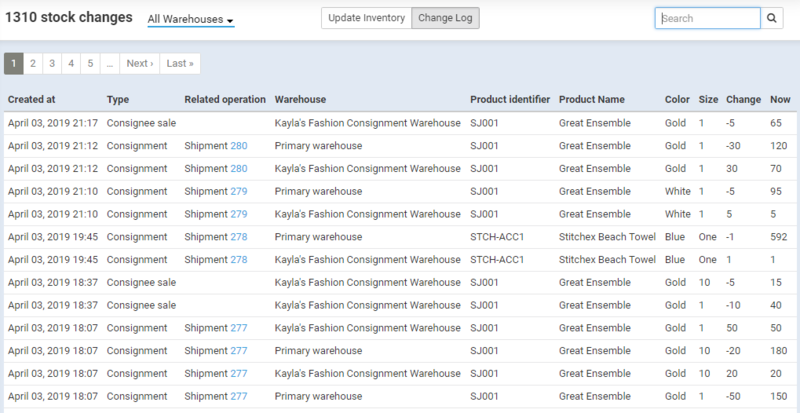 As your customer sells products out of their consignment inventory, you can also see their in stock levels go down. Please see the Buyer's Consignment Inventory Knowledge Article for information on how the Buyer can manage their inventory related to the receipt and return of inventory. You can see all Inventory Transactions from the Adjustment Inventory screen. This screen will show you the dates, the shipments, products, quantity changed and what is remaining in stock (now). The "Type" field is labeled as "Consignment" for Shipments or "Consignment Sale" for anything sold by the Buyer. To access this screen, click on the "Inventory Adjustment" from your main, left vertical menu. Then click on the Change Log button in the middle of the screen.